Over the past few years the UK has really got into the spirit of Halloween. The UK has finally started to embrace everything spooky. 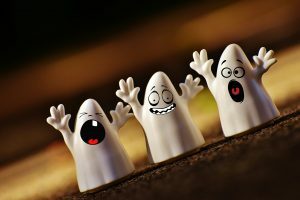 This Halloween there are lots of special ghost-themed events happening up and down the country. Make the most of the festivities by exploring in your motorhome – accommodation taken care of while you get out and have fun. Every year there seem to be more and more events to celebrate Halloween popping up all over the country. There are spooky events planned across the country this October too. 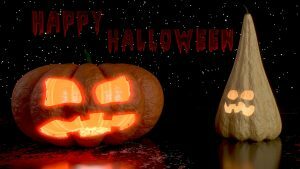 Make the most of the festivities around the UK by exploring in your motorhome and finding unusual ways to celebrate Halloween with accommodation taken care of. Whitby has a strong spooky association at any time of year, as the ruined Whitby Abbey is said to be the inspiration for the horror classic ‘Dracula’. Visit the Abbey at night to see the illumination show, and during the day for family-friendly trails and activities. This year at the Abbey, English Heritage are running Halloween events including storytelling and a special Halloween trail. Whitby’s Goth Weekend between 27th and 29th October 2017 is a celebration of the weird and wonderful, with a music festival thrown in. If you’d prefer things a bit quieter, base yourself in Scarborough or in the North Yorkshire National Park, then travel into Whitby every day. There are a few campsites around the Whitby area, such as Whitby Abbey and Folly Hall Farm. The Eden Project is fantastic fun at any time of the year, but during Halloween there are special performances, spooky sideshows and storytelling events. There is also an ice rink if you need a break from the ghosts, and the cafes will be selling special Halloween themed meals. Close to the Eden Project are other Cornish gems such as the historic docks at Charlestown, and lovely beaches at Gorran Haven and Polkerris. There’s even a campsite on the Eden Project site, which has a shower block and access to communal areas of the adjoining Youth Hostel. The small Lancashire town of Pendle was home to the most famous British witchcraft trials of the 17th century, with 10 local women being hanged on Pendle Hill as witches. Although the scenery is stunning during the day, by night things become dark and creepy. Are you brave enough to find out whether the stories of haunting by the spirits of the hanged women are true? Derry’s Halloween celebrations are among the UK’s biggest with thousands of people flocking to the city to join in the fun. The highlight of the celebrations is a spectacular parade on the evening of the 31st, with a fireworks display over the river Foyle. Dressing up isn’t compulsory but why not join in the fun with your best scary costume? Warwick Castle has extended opening through the week leading up to Halloween, giving visitors the opportunity to experience the castle in the dark. There’s a maze to explore, jousting demonstrations and storytelling, and if you’re feeling really brave, head down into the castle’s dungeons to learn about the castle’s gruesome history. There are several campsites within easy reach of the castle. While you’re in the area, make sure to visit Stratford-Upon-Avon or the elegant town of Leamington Spa. You could even pop into visit us here at Travelworld which is not too far from Warwick. Located just outside Inverness is Culloden Battlefield, site of the last land battle in the UK and where an estimated 2,000 soldiers died in 1746. Widely reputed to be haunted, the moor is bleak and isolated and more than a touch unsettling. Inverness is just 5 miles away if you need a break from the bleakness of battle. Alton Towers in Staffordshire bills its Halloween events as “Scarefest”, but this is an event which is for both adults and kids. 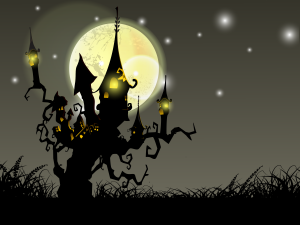 Adults and older kids will love the scary mazes populated by zombies and other scary creatures, and younger kids can enjoy a trick or treat party and go on all their favourite rides in the dark. Experience the theme park’s best rides in the dark, catch a live show or enter the House of Monsters maze if you’re brave enough. You can’t park overnight at Alton Towers, but there are several campsites within easy reach of the theme park. Muncaster Castle in the west part of the Lake District is one of the most haunted castles in Britain. Visit at Halloween to see the famous cabaret featuring fire breathers and acrobats, and try to navigate your way through the scary maze in the dark. Spooky crafts and storytelling are also laid on for the kids. Do you dare to explore the haunted village which appears in the grounds of Kentwell Hall in Suffolk each October? It’s not called Scaresville for nothing; be prepared to scream, find your way through the scary village in the pitch dark, laugh and be totally terrified. It’s definitely not something for the kids. Being lost in a maze is scary enough, but imagine being lost in a maze with scary clowns and werewolves lurking around every corner? It’s not everyone’s idea of fun, but if you enjoy the feeling of your heart pumping and adrenaline flowing, head to York Maze for their special Hallowscream event. Terror mountain is one of Wales’s most scary Halloween events, due in no small part to its location in a disused silver mine. The scariest attraction – and strictly for adults only – is the Face It Alone Challenge where participants have to try to find their way out of the mine in total darkness, with only a glowstick to light the way and zombies for company. Edinburgh has many tales of ghosts and spirits, especially in the streets of the Old Town near the Castle. Book onto a guided ghost walk to find out a bit about the history of Edinburgh, with a few surprises along the way. Dedicated ghost hunters should check out Mary King’s Close, a subterranean warren of streets below the city, blocked up in the 17th century. If you prefer your Halloween fun less terrifying and more peaceful, then head to Arnprior Farm in Stirlingshire. 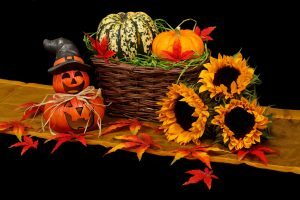 See the pumpkins growing in the fields and choose one to take home and carve, or join in with the other activities such as face painting or kale mazes. Active fun with a Halloween twist comes to Newbury this year with a Zombie Survival run through the town. Take on the challenge of the 5km obstacle course over inflatables with zombies in hot pursuit. You can even dress up as a zombie yourself if you want to get into the spirit of the event. Although parking a motorhome in London can be a challenge, it’s worth finding a campsite close to the tube network and take in the Halloween events at the Tower. Book onto a twilight tour around the Tower after dark, guided by a Yeoman Warder who will detail the darker side of the Tower’s history. Family friendly Halloween events are also running during daylight hours. Wookey Hole’s Halloween activities are suitable for the whole family. Kids can learn to ride a broomstick or meet the witch in her grotto, or book a ticket for the special Halloween circus show for spooky entertainment with a difference. Visit Northern Ireland’s capital on the weekend before Halloween for a Mexican “Day of the Dead” themed celebration with street theatre, dancers, fairground rides, street food stalls and a huge fireworks display to round off the festivities. Alnwick Castle and gardens is where scenes from the first Harry Potter movie were filmed, and visitors can try their hands at learning to ride a broomstick in the castle grounds. The gardens have a spooky treasure hunt for the kids, and adults can tour the Poison Garden, to learn about all the plants native to the UK which could cause a gruesome end. Ghost Fest is running at Oxford Castle until Halloween, with guided tours around the sinister side of the castle for adults and older children. For the ultimate in scary tour, there’s even a tour at midnight on Halloween, but if you’re looking for something tamer, family friendly events run throughout the Halloween period. Blackpool’s famous Pleasure Beach gets a scary makeover for Halloween, with vampires and zombies roaming the park looking for victims. Are you brave enough to take them on as you move between the rides? If that all sounds too terrifying, the famous Illuminations run through to 5th November – not a zombie in sight. Muncaster Castle in the west part of the Lake District is reputedly one of the most haunted castles in Britain, and over the Halloween weekend is hosting ghost tours, a fireworks display and owl display among other spooky events. Bring a torch, and wear fancy dress if you really want to get into the spirit of the season. Camping options close by are plentiful, so take the opportunity to explore the Lake District at a quieter time of year and see the autumn leaves around Windermere or Coniston too.